Back in April 2016 I read Elizabeth Bowen’s The Death of the Heart, a brilliant book that made my end-of-year highlights – you can read my review here. First published in 1927, The Hotel was Bowen’s first novel. It’s a striking debut, a story of unsuitable attachments and the subtle dynamics at play among the members of a very privileged set, all cast against the backdrop of the Italian Riviera in the 1920s. In many ways, the novel revolves around Sydney Warren, a somewhat remote yet spirited young woman in her early twenties. Sydney has come to the hotel to accompany her older cousin, Tessa Bellamy, who in turn is trying to deal with a gastric condition. Sydney’s family are delighted that she has travelled to Italy with Tessa, viewing it is an ‘inspired solution of the Sydney problem’, in their eyes something to counterbalance the girl’s leaning towards the neurotic and her tendency to be ‘so unfortunate in her choice of friends’. For her part, Sydney has developed a rather unhealthy attachment to another resident, Mrs Kerr, an intriguing, self-assured woman in her forties. While Mrs Kerr is a widow, she appears to act more like a divorcee; at least that’s the opinion of several of the other guests at the hotel who seem enjoy speculating about Mrs Kerr and the nature of her relationship with Sydney. I love this next quote, a passage of dialogue so indicative of Bowen’s penetrating tone. In this scene, Tessa is in conversation with several other ladies in the hotel drawing-room. ‘Sydney hasn’t lost her head,’ said little Tessa with dignity. And so the discussion continues in a similar vein. Other notable guests at the hotel include Mr and Mrs Lee-Mittison, the Ammerings and their son Victor and the Lawrence girls, Veronica, Eileen and Joan. Mr Lee-Mittison is determined to surround himself with the beautiful, refined young people, and there are some classic scenes involving a picnic he attempts to orchestrate with mixed results. While the Lee-Mittisons are very happy for Sydney and the Lawrence sisters to attend, they are none too pleased when Victor Ammering shows up on the scene, much to Veronica Lawrence’s amusement when she goes off with the young man. For her part, Mrs L-M, a devoted wife, will do anything she can to ensure her husband’s social events are a success. It’s all quite amusing to observe. Also staying at the hotel are Miss Pym and Miss Fitzgerald, genteel elderly ladies very much of the type depicted in Fawlty Towers, and two sisters-in-law, the Honourable Mrs and Miss Pinkerton, who have paid extra to have exclusive use of the bathroom opposite their rooms. When middle-aged clergyman James Milton arrives at the hotel following a long train journey across the continent, unaware of the bathroom arrangements he goes for a long soak in the Pinkertons’ bath, much to the consternation of the ladies on his floor. James Milton’s appearance on the scene shakes things up a little in more ways than one. In the hope of attracting Sydney, he rushes out a terribly ill-judged proposal of marriage to her during a walk in the countryside (there is a sense that he is comfortable operating within his own relatively small circle of society, but much less so in this wider sphere). Sydney declines, giving James the impression that there is no point in his holding out any hope of a change in heart; but then the situation changes once again with another arrival, that of Ronald, Mrs Kerr’s twenty-year-old son. Before long, Sydney realises that Mrs Kerr has given her the brush off in favour of Ronald, a fact that becomes painfully clear to her during a conversation with Veronica Lawrence. Once again, Bowen demonstrates great insight and precision in painting this scene; here’s a brief extract from the extended discussion between these two girls. ‘Do you mind the way she’s going on?” asked Veronica curiously. In a rebound response to being sidelined by Mrs Kerr, Sydney agrees to marry James Milton, a development also prompted, at least to a certain extent, by Veronica’s attitude towards marriage. In many ways, Veronica sees marriage to a man as an inevitable outcome for a woman in her position – so if she has to marry someone it may as well be Victor Ammering, to whom she has just become engaged. It is from this point onwards in the novel that Mrs Kerr’s cruel, manipulative steak really starts to show itself. When James reveals his engagement to Sydney, Mrs Kerr carefully plants the seeds of doubt in his mind. To say any more might spoil the story, but it’s a brilliant scene, beautifully observed. The Hotel feels incredibly accomplished for a debut novel, full of little observations on human nature and the dynamics at play. In some ways, it could be seen as a cold book as there is very little warmth or affection in most of the relationships depicted here. That said, I certainly don’t mean this as a major criticism – it seems to be a function of the characters and the society in which they find themselves. These people are gravitating towards one another for convenience and perhaps a vague kind of protection or social acceptability. Veronica seems to be making do with Victor; while happy enough, she doesn’t appear to be in love with him, although that might come in time. James is on the lookout for a wife, and Sydney seems to fit the bill. As for Sydney herself, I feel for her even though she behaves rather foolishly, especially towards James. She is young and inexperienced, and the worldly Mrs Kerr has clearly toyed with her affections. By the end of the story, Sydney sees her sophisticated friend for what she really is: a rather spoilt, insensitive woman. This is a novel to be read slowly. At times, Bowen’s prose can appear rather dense and intricate, but it does rewards the investment in time and concentration. As one might expect, Bowen is excellent when it comes to capturing the atmosphere of this elite world, complete with its tennis matches, picnics and tiresome excursions to places of interest. She is particularly good on hotel etiquette. I’ll finish with a passage on the social codes at lunch, so typical of this author’s keen eye for detail. I read this book with Dorian (of the excellent Eiger, Mönch & Jungfrau blog). You can find his terrific analysis here. The Hotel is published by Vintage Books; personal copy. This entry was posted in Book Reviews, Bowen Elizabeth and tagged #ReadWomen, Book Review, Classics Club, Elizabeth Bowen, Fiction, Hotels, UK, Vintage Books on February 1, 2017 by JacquiWine. I have not come across this book by Elizabeth Bowen before, but it’s good to know (though perhaps discouraging to us aspiring writers) that she was as witty, observant and stylish from her very debut. Witty and observant for sure. She has such a great knack for capturing the nuances of various social interactions – body language for example, the little gestures and looks that pass between these characters at different points. Her style is interesting if somewhat challenging – not always the easiest to get to grips with as she can be rather oblique! There were times when I wondered if she was still trying to find her ‘natural’ style (especially as this was her debut novel). Nevertheless, there’s much to admire here. Thanks, Karen. Interesting that you feel the same way about her style. I’m really glad I read this one, and I didn’t find it quite as challenging as that Sybille Bedford I read last year (A Legacy). The short stories are on my list for the future, probably once I’ve tried a few more of her novels. I like the prose in the passages that you posted. It is dense and it is different. Those this can be a bit difficult to read, is original. I tend to like prose that is a little unconventional. Thanks, Brian. Yes, there’s a lot to be said for originality and distinctiveness. I think you would like Elizabeth Bowen a great deal – she’s definitely worth the investment in time. The second Elizabeth Bowen review I have read in fifteen minutes minutes. I really liked The Hotel and the marvellous array of quirky characters. It is well observed and impressive for a debut novel. She has become one (on a long list) of my favourite writers. I’m hoping that was Dorian’s post as we read The Hotel together! Yes, her observations are excellent. I love the way she captures these people in their private moments – it’s so easy to visualise the scenes she describes in vivid detail. No, it was Harriet Devine who read To the North. Bowen does describe her scenes perfectly. Ah, right. I’ll take a look at that – thanks! Dorian refers to it as cold too interestingly. That first quote, the word that came to mind was circumlocutory, which is a word that should come to mind more often I suspect. It fits Dorian’s quotes too. Nothing direct, much implied. Dorian concluded that this wasn’t a good first Bowen, but like Guy Savage (and many others) I’m a sucker for hotel stories. What’s your view on that? Yes, there’s not a lot of warmth and affection in the relationships here. Well, with the possible exception of the bond between Miss Fitzgerald and Miss Pym – but, as Dorian quite rightly points out, these ladies do not feature prominently in the book. Circumlocutory is good way of describing the prose, certainly. It is rather protracted at times – but then again, it also feels very believable given the period and social milieu Bowen is depicting here. There’s a lot of reading between the lines in the dialogue between these characters, As you have noted above, little is said directly but so much is implied. Lots of slurs and slights here and there – doubts are planted and left to fester. As for whether it would make a suitable first Bowen, my feelings are a little mixed. I started with The Death of the Heart, which I loved to bits – then again, it’s meant to be one of her best novels so I may have peaked too soon! (It’s actually pretty close to being a masterpiece, and I hope to re-read it one day.) To be honest, I think you could dive straight in with The Hotel, especially as the setting appeals – just be prepared to work with it. I haven’t yet read Grand Hotel. I started it but it got interrupted by work so I put it aside so I could reread the first chapter or two without it feeling like repetition. This might make a good companion piece. I’ll look out the Patrick White. Not only have I not read it, I’ve not even heard of it. Aunt’s Story has been out of print in the US for ages. I just checked Book Depository, though, and it looks like Vintage UK has a nice new edition. It is one of the weirdest books I’ve ever read. Really brilliant and beautiful but also kind of crazy-making and difficult. I’ve not read that much White but this one is my favourite for sure. I liked Grand Hotel a lot. Definitely worth getting back to, though I know how it goes when you have to put things aside for a while. It might be weird to say that a Novel Prize winner is underrated, but I think he’s underrated, at least outside Australia. Not sure how he rates there. Yes, I had the same impression. An Australian friend has recommended him to me in the past, so maybe he is better known down there. I’d say White is out of fashion here. I wonder if younger readers are reading him at all. The Vivisector, based on Sydney Nolan’s life, is a truly great novel. Yes, I agree that Baum makes great use of the hotel setting. By the end of the novel, there is a sense that each and every character has undergone some kind of change as a result of their time at the hotel – some for the better and others for worse. That said, I do think Bowen has an eye for social etiquette in the shared areas of the hotel, places like the drawing room or dining room where one can glean so much about a certain character’s personality or status just from the way in which they behave or carry themselves. I’m hoping that my final quote serves to give an indication of this – it’s a brief excerpt from a longer passage. You’re right about that passage you cite. Maybe I just missed how important the hotel setting is to the novel. Perhaps it was having read the Baum and also A Gentleman in Moscow recently, where the hotels really matter, that made me overlook this. I guess I read it as more an interest in manners people display in hotels than in how hotels shape manners, if that makes sense. Makes perfect sense! Baum definitely uses the hotel setting in a different way to Bowen. It feels more integral to the storyline in Grand Hotel. Nice cover in that photo by the way. The ones currently on sale seem to have much blander covers. I’m glad you like the cover. It’s actually a fairly new edition from Vintage Classics, published last year I think. The previous version was rather staid, so I’m delighted I managed to find this one. She’s hit and miss for me. Some of her short stories are gorgeous but the prose in the novels is occasionally too dense. She’s never breezy but in later novels the phrasing is sometimes akward. I hadn’t been aware of this novel at all. Like Guy and Max, I love hotel stories, so I’ll keep this one in mind. I recall you mentioning your experiences with The Heat of the Day as part of the Literature and War readalong. Definitely a novel I’d like to try at some point, but maybe it’s one to work up to over time as opposed to rushing in too early. I love hotel-based stories too, so the premise of this really appealed to me. It’s not an easy novel to read, but there’s still much to enjoy here. Her observations are wonderful – she shares something in common with Elizabeth Taylor in that respect, even if her prose is more challenging. The question with challenging prose is – is it a mannerism or an art form and in The Heat of the Day I found it more mannered than artful. But she’s written some of my favourite short stories. I also got her biography and started it. I think it helps to understand, especially the war stories. I can see what you mean about the difficulties in The Heat of the Day, though – it sounds as if her prose style was getting in the way of other elements of the novel, and that’s never a good thing. Her short stories sound excellent, so I’ll have to look out for a collection at some point. It makes perfect sense. It sounds like the style underlined the themes. Not so much in The Heat of the Day. I’d be interested to hear what you think of her short stories. I love them. Yes, that’s it exactly. Praise for her stories is coming thick and fast so I will definitely be looking out for them in the future. I’m hoping there might be a nice collection in the Vintage Books range. I actually disagree about the style of Heat. To me the convolutions really work there because the story is about secrecy, disguise, betrayal, etc. You’re forced to spend so much time wondering if people are who they say they are that it starts to make sense to describe this world in a similarly untrustworthy, or at least non-transparent or straightforward language. I do agree about the stories. Admittedly I’ve only read a couple, and she wrote *a lot* of them, but the ones I did read were terrific. It’s interesting that a lot of what you say about the prose in this book reminds me of the prose in her To the North, which is the only novel I’ve read by Bowen. It took some effort for me to read it, but the work was worth it. It sounds like this was an impressive debut. That is interesting. I’m really glad to hear that you liked To the North as it’s definitely in my sights for the future. Bowen’s not the easiest author to get to grips with, but she does reward persistence. I like the fact that she’s not afraid of leaving plenty of space within a story for the reader to consider and interpret. The more I think about this novel, the more I admire it – lots of things are left unsaid here which adds an air of mystery to some of the characters (Mrs Kerr in particular). Had to check my log because I always forget which one of hers I’ve read (it was Heat of the Day, and I often think it’s the previous one you’ve read, Death of the Heart); after I read that one, I began to studiously collect her work because I so appreciated her detail in time and place and characterization. This sounds every bit as good (but it wasn’t one I’d managed to find)! Yes, she’s great on all of those things. I was very taken with The Death of the Heart when I read it last year, so I’ve been picking up her books ever since. The Heat of the Day is definitely on my list for the future, but I’m wondering whether to save it till the end – the premise really appeals to me as I’m a sucker for anything featuring the Blitz. Out of interest, did you find it a challenging read? I know others have struggled with this in the past, so I would be interested to hear about your experience with it. I bought The Death of the Heart at the weekend, remembering how much you loved it. I’m taking this review of another Bowen as a sign I need to get on with reading it, and more besides! Great review as always, Jacqui. 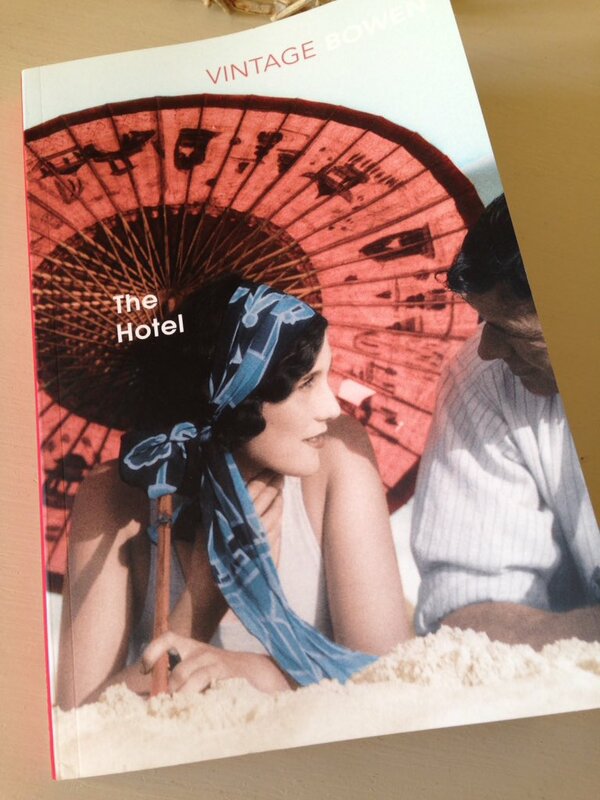 Check out this review of the book, The Hotel by Elizabeth Bowen courtesy of the Jacqui Wine blog. Many thanks for sharing my review, much appreciated! I’ve only read The Heat of the Day – many years ago – which I liked, but I think at that time most of her other work was out of print. There seems to have been a mini-revival recently which is good news. Most of her novels are back in print now. I’ve been trying to pick them up over the past year – The Heat of the Day included. Lovely review Jacqui. Bowen is a writer I haven’t yet read, but her intricate and perceptive style seems reminiscent of Taylor or Pym and I suspect I would like her a great deal. The quotes reveal a sharp eye and pen, and a neat way of capturing both character and motivation with a few well placed observations. Probably closer to Taylor than to Pym, but she’s definitely in the same ballpark. Interestingly, the other female writer who came to mind while I was reading this book was Edith Wharton. Bowen’s dissection of the workings of the privileged society depicted here reminded me of Wharton’s skills in this field. I probably need to read more of both of these writers to form a better view on this, but I suspect there might be some similarities between the two. There is something captivating about a mix of strangers in an intimate space. Such a situation having been recorded in a book implies that something’s going to happen! Oh, Grand Hotel is a wonderful book! I read it last summer and was captivated by the various characters and their interactions with one another. There is a sense that everyone is somewhat changed by their experiences at the hotel, some for the better and others for worse. It’s a story with an interesting mix of light and shade. I finished this last week and am still thinking about it. I had read A Room with a View recently as well and found the Bowen much more to my liking. From start to finish it had me captured. (spoiler): I see the end as not really the end. Thinking Sydney & James are not done with each other!!!! Oh, how intriguing! What I liked about this was the way that Bowen left so much unsaid, so much to the reader’s imagination – e.g. how did the relationship between Sydney and Mrs Kerr begin in the first place? I keep thinking about it too, even though it’s been a while since I read it. The sign of a good book, I think.